At its simplest, a rhombus is defined as any simple (non-intersecting) quadrilateral that has 4 sides equal in length. According to this definition, a square is also a rhombus, one in which all of its angles are right angles. Other names for a rhombus include “equilateral quadrilateral” and “lozenge”, though the latter term is normally reserved for the special rhombus that has 2 45° angles and 2 135° angles. It can be proven that the rhombus is a special case of the parallelogram, one in which all 4 sides are equal length. This means that all rhombi are parallelograms, though the opposite does not necessarily hold as there are parallelograms that are not rhombi. Every rhombus is a kite—a quadrilateral with congruent adjacent sides. The word “rhombus” comes from an ancient Greek word meaning “to spin.” Euclid used the term “rhombus” to describe that 2-D shape that arises from taking the cross section of two circular cones that adjoin at the base. This property of a rhombus also shows that is is a parallelogram as an essential property of a parallelogram is that its opposite angles are congruent. That is if a quadrilateral has congruent opposite angles, that is enough to guarantee it is a parallelogram. So we can prove that adjacent angles in a rhombus are supplementary. So we have just proven that the diagonals of a rhombus bisect the opposite angles. 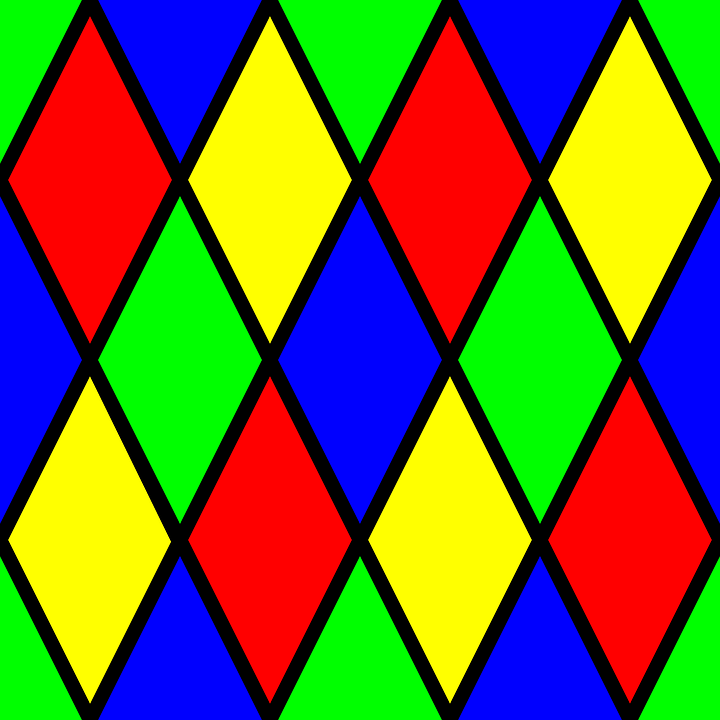 This is a unique property of rhombi that is not seen in other kinds of quadrilaterals. 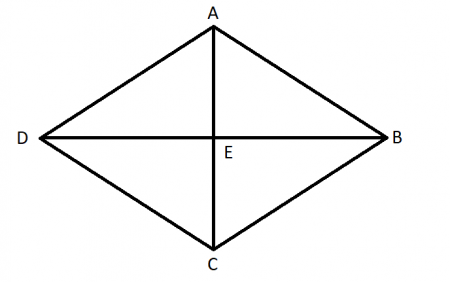 The 4th major property of a rhombus also has to do with its diagonals. It is a fact that for a rhombus its diagonals bisect each other; that is, they each cut each other into two equal line segments. 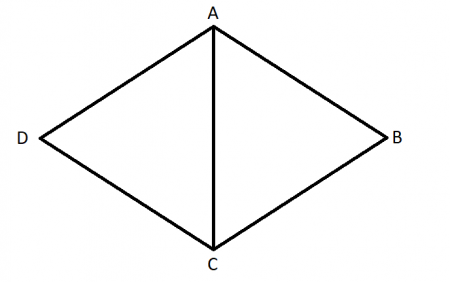 The point at which they intersect is the middle of both diagonals. The area of a rhombus can be calculated exactly the same as every other kind of quadrilateral, multiply the base times the height. The height of the rhombus is the measure of a line drawn a perpendicular from one side to the opposite side. 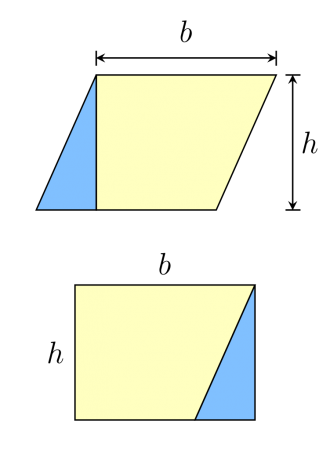 The reason why the area formula for a rhombus is the same as a rectangle is simple; every rhombus (and parallelogram) can be cut into pieces and rearranged into a rectangle with the same base and height (the following picture is of a non-rhombus parallelogram, but the same principle holds for rhombi). If you draw a line perpendicular from one base to the end of another base, you get a trapezoid and a right triangle that you can rearrange into a rectangle with the same area as the original rhombus. Therefore, the area of a rhombus can be calculated as half the product of its diagonal lines. The rhombus can also form tessellation, meaning you can arrange rhombus in regular patterns to completely fill a 2-dimensional face. 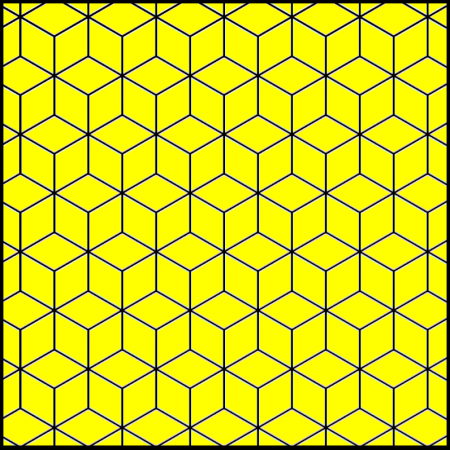 A tessellation made out of rhombi is called a rhombille tiling. Tilings of identical rhombi can fill a plane in three different ways; as a consistent stack of diamond, an alternating stack of diamonds, or as groups of 3 rhombi arranged in a cube face. 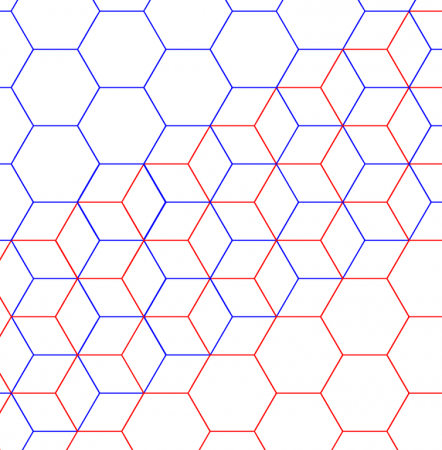 You can also form the rhombille tiling from a regular tiling of hexagons. Simply divide each hexagon into three by drawing lines from every other vertice that meet in the center of the hexagon. Rhombi can be arranged into tessellation because they can be arranged in such a way that the sum of angle surrounding each point is exactly 360 degrees. This is a necessary property of shapes that can be tessellated; if you can’t arrange a shape in such a way that the sum of all the angles that meet at a vertex is 360, then you cannot make a regular tessellation out of it. To sum up, a rhombus is the name of a quadrilateral in which all 4 sides are of equal length. All rhombi are parallelograms and a square is a special case of a rhombus in which all 4 interior angles are right angles. The key properties of a rhombus are its opposite angles are congruent, its adjacent angles are supplementary, its diagonals bisect opposite angles, its diagonals bisect each other, and its diagonals are perpendicular to each other.